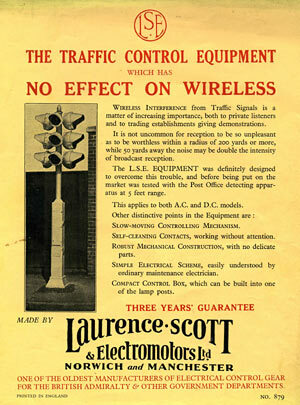 A leaflet advertising Laurence Scott traffic lights, in the 1930s. Homepage. This page: An unusual pre-war leaflet advertising the latest traffic control systems by L.S.& E. of Norwich & Manchester. This is the first traffic-light-related item I've featured here, but as traffic lights have been part of the motoring scene since the very early days, it seemed appropriate to include this here. The leaflet, dates to the 1930s, advertises the traffic control system produced by Laurence Scott & Electromotors Limited, "one of the oldest manufacturers of electrical control gear for the British Admiralty & other Government Departments". "Wireless interference from Traffic Signals is a matter of increasing importance, both to private listeners and to trading establishments giving demonstrations. It is not uncommon for reception to be so unpleasant as to be worthless within a radius of 200 yards or more, while 50 yards away the noise may be double the intensity of broadcast reception". Compact control box, which can be built into one of the lamp posts. Surprisingly, the company, or rather it's descendant, still continues to produce motors for all manner of applications. Their design of traffic signals does get a mention here and there on the web, confirming that production of their traffic light systems was a sign of diversification on the manufacturing side of the business, during the early 1930s. A huge amount of information about LSE can be found on this Norfolk-orientated website. How long they actually produced traffic lights for I'm not sure, I get the impression that it was something they looked at, but perhaps didn't devote a great deal of attention to?